Why not go for something different and cruise around in style when you’re here visiting in Miami? Miami is a bustling urban area known for its beautiful beaches, stellar weather and, as you may have guessed, trendy automotive scene. It only makes sense, then, that you’re rolling around in the appropriate car for rent as you drive around the streets in famous neighborhoods like Coconut Grove, South Beach, and Wynwood. While using a taxi service like Uber or Lyft is a realistic idea, let’s be real – waiting on a car to come pick you up can get a little old. Instead, why not take charge of your transportation situation and go places exactly when you want to? Simply get in touch with our Miami car rental service before your trip and we’ll take care of the rest! Our concierge services mean that we can pick you up from the airport and take care of you until you’re off with your fancy car rental. In fact, we’re here to talk about a particularly exclusive special car rental that we’re offering…the BMW i8! Continue reading below in today’s blog post to learn a little bit more about why renting a BMW i8 is a great idea, or learn more about how our rental services work by visiting this page. The BMW i8 Is A Hybrid Sports Car! The past generation or so of automotive technology has inspired a wave of cars that go ridiculously fast without completely destroying the environment, and the i8 is a great example of such a car. With a 0-62mph time of a lightning fast 4.4 seconds, this slick ride is sure to whip your passenger’s head back as you stomp on the gas. After all, this is a proper BMW inspired by the iconic race track of the Nürburgring in Germany. Just because this car has an electric motor component certainly doesn’t mean that it isn’t race-inspired, reminiscent of its racing roots. Why drive around in a nice sports rental car if you can’t show it off a little bit? You could always go for some lackluster econobox rental that will get you from Point A to Point B, but it won’t get you from one place to the next in style. The strikingly sharp design of the i8 means that you’ll be making a stand amongst all of the exotic sports cars in Miami. So Why Not Rent A BMW i8 Today? With fantastic looks, blistering speed and surprisingly environmentally-friendly qualities, the BMW i8 really is the complete package of what a car rental should be, especially in a place like Miami. 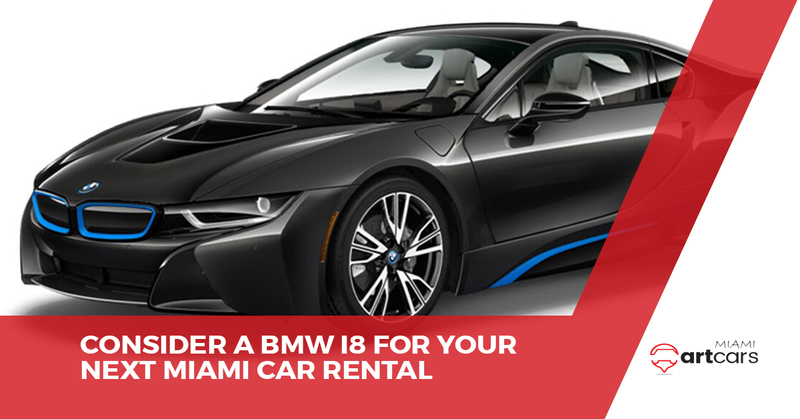 You deserve the finest car for rent when you’re out here visiting in Florida, so get your own BMW i8 rental today! Contact Miami Art Cars now. Rent Your Own BMW i8 Today!